Play video How will Man Utd & Man City fare? See you tomorrow for the Europa League. Hopefully. Are you going to tell him or me? Rafael Benítez, Real Madrid coach, speaking about Cristiano Ronaldo's scoring record: "I hope that Ronaldo doesn't ever stop scoring and that we can keep benefiting from him." We need to talk about Cristiano. He scored both against Malmo taking his tally to 501 career goals. Not content with that, he also went level with Raul as Real Madrid's all-time top scorer. But - and here is a stat for you - Raul did it in 741 games. Ronaldo in 'just' 308, that's 433 games to spare. Manchester City midfielder Kevin de Bruyne: "We only played the last half hour, in the first hour it was very difficult for us. This was our worst match this season." Manchester United manager Louis van Gaal on BT Sport: "It was very difficult because they scored so early. Then we did very well, we created a lot of chances. We don't finish it and it was a lucky penalty I think. "Of course it is a penalty but there are some refs not whistling for that. We have created much more chances, Rooney and Depay could have scored and you finish the game. "Then we score and after that it was suffering. A lot of players are very tired, a combination of a lot of matches but we didn't give much away. How many chances have we given away? Maybe one. "We have to keep the ball better in the second half." Alan Shearer scored 260 Premier League goals. Cristiano Ronaldo got his 500th career goal today. Kyle Utterson: Those that keep having a go at Wayne Rooney are clueless. He's still top drawer. United are better with Rooney in the team. Rooney's record for club and country is excellent plus his workrate and runs create space for others. Meetal Tailor: Good win tonight. Even better given we played with 10 men the entire game. Still wondering where Rooney was? Totally absent. Kyunlin: That United came back from a goal down shows the progress we've made. Wouldn't have happened last year. Manchester City manager Manuel Pellegrini: "It was a strange game! For 65 minutes both teams had very good chances to score, we did not defend well. In the last half hour we improved a lot and won the game. "We knew that Borussia have a very fast team. Joe Hart made some brilliant saves. It could have been 4-4 after an hour but then we dominated the game. "We got a little bit of luck at the end but we have had plenty of bad luck recently." Manchester City goalkeeper Joe Hart: "We didn't play well today, we were disjointed as we had been in the last few games. But we deserved to win, we had some really good chances. It may have come late but Sergio Aguero is a cool guy and he will score. "Kevin de Bruyne warned us about them [Monchengladbach], they have some good movement and work themselves into the ground. We won and it puts us in a good position. "For the penalty no stone is unturned. I've seen a lot of penalties from a lot of players - we have good guys in the analysis department. We always take the scenic route in Europe!" Sownak Bose: Wayne Rooney was comfortably the worst player on the pitch. Which is basically the usual for him these days. Chris Knaggs: To the Rooney bashers: he is the captain and heart of constantly improving team. His game has changed, deal with it. Seth Gogo Egoeh: Since Rooney started losing hair his performances follow suit. He's been a big disappointment tonight. Manchester United midfielder Juan Mata, speaking to BT Sport: "It was a very tough game because we were physically tired at the end. But we did what we had to do. "The manager made a list of penalty takers and I am the first right now and I have confidence. We knew we had to win today. We are happy today." The whistles have been blown all over Europe. PSV, who beat Manchester United last time out, lost 3-2 to CSKA in Moscow. PSG beat Shakhtar 3-0 in Lviv. They are locked at the top of the Group A table with Real Madrid who beat 10-man Malmo 2-0. Manchester United defender Chris Smalling, speaking to BT Sport:"We started up against it after conceding a goal. "But we created a lot of chances and deserved the win. We didn't give them too many chances. We created some ourselves which gave us a deserved victory. "We knew they played with two wingers which gave us space, Anthony Martial's pace used that well." Manchester United's win means that Group B is all square - all four teams are on three points. Very level. Chiemezie Onwubalili: Take that! English football in decline, what nonsense. Oluwaseun Badejo: Manchester showing London how it's done in the Champions League. Stuart Mitchell: Looks like Manchester are doing their best to keep the English entries at 4 for next season. Can't say the same for London. "Boos for the officials as they make their way down the tunnel but it doesn't mask the sense of relief for United fans at the final whistle. "Sir Alex Ferguson coined the phrase 'Squeaky Bum Time'. "Seems Van Gaal's United can put their supporters through it as well." "This is an important result which did not seem likely 10 minutes ago. It's a big comeback for Man City. The main positive was the performance of Joe Hart, because Monchengladbach could have been 3-0 up at one point. City will look back and realise they were quite lucky given the first half." A shake of the head from Manuel Pellegrini. That sort of entertaining, end-to-end rollercoaster is not what the coaches want. A belter for the neutral though. And Manchester City are back in business. Colin Reardon: Chris Smalling - man of the match by miles. Rooney - abject nonsense! Rich Olyott: Smalling motm. Rooney sloppy. "It was quite an even game. The last 20 minutes Wolfsburg asked a lot of questions but couldn't put the ball in the net. Manchester United were wasteful in possession in the second half but weren't punished." A lengthy stoppage here as Yann Sommer has his nose re-arranged. The Manchester City fans are in fine voice. What a comeback, and a deserved one too (if they hang on!). He's done it. Cristiano Ronaldo scores his second goal of the night. And has now drawn level with Raul's all time goal scoring record for Real Madrid - just the 323 goals. He has a few years in him yet. How many more can he score. 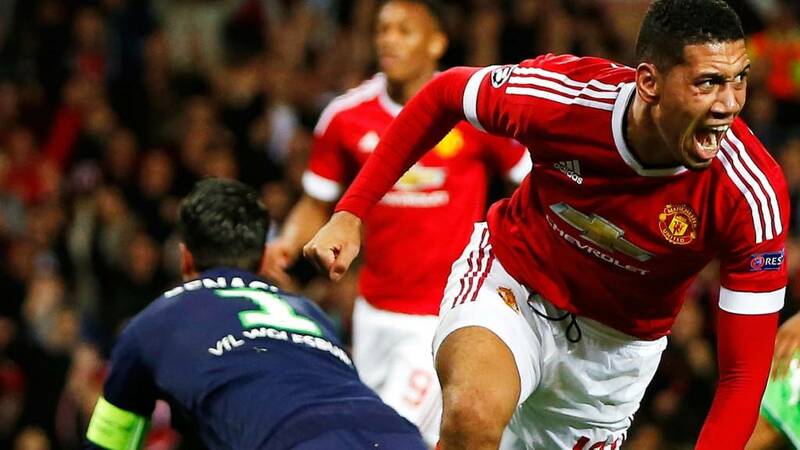 Chris Smalling is the unlikely match-winner at Old Trafford. "It looks like it's going to be Manchester 2 Germany 1 tonight then." Almost three as Sergio Aguero meets a Kevin de Bruyne cross, brilliant save from Yann Sommer. Just the 38 efforts on goal tonight. One every two minutes. Sommer took a kick in the face too as he made the save. The Wolfsburg contingent in the directors' box were getting ready to acclaim the equaliser just then. They were certainly off their seats before having to sit down as the free-kick whistled narrowly wide. There is a definite sense of unease around Old Trafford as these final few minutes tick down. Shohidur Rahman: Dumbfounded by Van Gaal's to take off Schweinsteiger when he was bought for exactly this situation. Stuart Mitchell: Man Utd need Schweinsteiger or Carrick in the midfield at all times, with the latter not involved why was Basti subbed?? Colin Reardon: Schweinsteiger off, Schneiderlin left on! Why?! "What a great fightback by Manchester City!" Cool as you like, side footed into the corner. What a game, and a huge winner for Sergio Aguero. how big is Joe Hart's penalty save now? Sergio Aguero tripped by Fabian Johnson - PENALTY! Wolfsburg have come close - again! Left-back Ricardo Rodriguez flings a free-kick over the wall but a yard wide. It came after what you would call an excellent foul from Morgan Schneiderlin as Wolfsburg threatened to break down the middle. "They struggled for much of the first half but Manchester City are finishing this game very strongly." Some interesting news from the other teams in Manchester United's group. PSV have pulled another goal back in Moscow. It's CSKA 3-2 PSV. However, Santiago Arias has just made it difficult for the Dutch side. He has collected a second yellow card and has departed the pitch. You can't knock Man City tonight when it comes to attacking. Very exciting to watch as Raheem Sterling heads over from Jesus Navas's cross. Defensively they've been terrifying but they have kept going up front. They have six minutes of normal time to find a winner. Sergio Aguero shoots! Just wide again. His sights are four yards out. Lose Bastian Schweinsteiger, lose midfield control. It's all Wolfsburg now - eight minutes left. Moan about English football being in decline all you want if you only watch Premier League and European football. But in reality, you just need to look at the depth of the English leagues to realise we are in fact progressing. We have more or less 5 fully professional leagues, plus several full-time sixth tier clubs. Which other countries can boast such depth? "Manchester United need to get hold of the ball and look after it for this last 10 minutes. They keep giving it away cheaply." Hugh Smith: Spot on from Simon Stone about Chris Smalling. Obviuosly hope we're not jinxing him, but playing excellently this season. David Broome: Schneiderlin? Once again, what does he do? Totally anonymous virtually every game he plays. Mr Lamide: Wolfsburg look like they'd just nick another goal at the moment.. United really need to add a third. Wayne Rooney has been largely anonymous as an attacking force, neat and tidy in midfield, and missed one big sitter. In short, a fairly typical performance based on his form of the last 12 months or so. Rooney, unlike Sweinschteiger and Carrick, is playing on reputation alone. He has been awful and has only scored against poor or lower league opposition. He HAS to be dropped for the Arsenal game. Fernandinho, side-foot, 25 yards. Roof of the net. Zeyad Eltom: When will Van Gaal -and everyone else- realise that Wayne Rooney isnt good enough to be a striker. Should be dropped to midfield. Sushant Shetty: Rooney must be really testing Van Gaal's patience. Walking on thin ice for sure with such a display. Thrilling stuff now. Kevin de Bruyne finds Raheem Sterling, his low ball is arrowed in for Sergio Aguero but keeper Yann Sommer keeps it out. Jesus Navas shoots the rebound wide. Seconds later Aguero beats his man but has a shot blocked and De Bruyne fires over. "Manchester United just can't keep hold of the ball here. Wolfsburg look a bit more dangerous." Former Chelsea man Andre Schurrle weaves a pattern into the box and shoots wide from a tight angle. That was close! It is odd that we don't have goal-line technology in the Champions League isn't it? That goal may be credited to Martin Demichelis in the end I suppose but all credit to Nicolas Otamendi. While others were concentrating on arguing with the officials he smacked it in. Raheem Sterling might have started slowly at Manchester City, but he is worth the money they spent on him if it means that they can play David Silva in a central position behind Sergio Aguero week-in, week-out this season. Silva is the key to Man City's success. The last couple of weeks has proven that. A thrilling final 20 minutes in store then. Jesus Navas is on for City, who are going for the jugular. Or any other major artery. City suddenly controlling the possession. So while we are waiting to see if Ronaldo can equal Raul's all-time goal-scoring record for Real Madrid, I can tell you thatPSVhave pulled a goal back againstCSKAin Moscow, where it is now 3-1. And the Portugese side Benficaare 2-1 up against Atletico Madrid in the Vicente Calderón staduim. It has taken a while but Chris Smalling is now showing the form that persuaded United to spend £12m on him in 2010 when he had only made 19 appearances for Fulham. He was still at Maidstone in the Isthmian League when he was 18, which gives hope to non-league footballers everywhere. There's belief for you! City are level. A corner from the left is kneed toward goal by Martin Demichelis. It's cleared off the line - behind the line! - and while several City players appeal for the goal Nicolas Otamendi takes the law into his own boot and thrashes the loose ball into the net via a deflection. Goalscorer Chris Smalling goes over hard on his ankle, that's an eye-watering one. He will carry on though. His goal the difference at the moment. Tom Humphreyson: Mata with assists, goals and just a general all round world class midfield display. Shohidur Rahman: Rooney once again awful tonight. When will he be dropped? The average positions graphic below shows Wolfsburg are still struggling to create too much going forward. Do you believe City can win this? More importantly, do they? All teams in Group B will have three points if the results stay the same. Is the difference between the two Manchester sides in Europe that when United went behind you still backed them to win - but City...? Max Baggins-Craig: City just terrible, they're all over place, speaks volume for Premier League's value and status - bearing yesterdays results in mind. Bibz: You know English football is in decline when Man City is losing to the worst German team in the Champions League. Barry Fryer: Sterling's waste of money, overated and out of his depth. Like chalkboards? Don't like Manchester City? Then you're going to love the snazzy graphic below which illustrates Monchengladbach's opener. What this doesn't show, however, is City left-back Aleksandar Kolarov being dragged inside to allow Julian Korb (27) the space to pick out scorer Lars Stindl (13). Nor does it show Stindl being allowed the freedom of the away penalty area. "Manchester United now enjoying more space with Wolfsburg coming on to them. I think the visitors will be making a few changes soon." Now's the time for City's £135m front three to come to the party. They had several good openings in the first half but this is playing out all too familiarly for City fans in Europe. Still over half an hour to go. Only Jesus Navas on the bench as a first-team attacker though. "You have to say this goal has been coming. It was a lovely cutback and Lars Stindl has finished it. Joe Hart had been brilliant to that point but he can't prevent a goal this time." Can Manchester United hang on to this lead? They have played well tonight, in general. Their finishing hasn't been great but Chris Smalling did well to stretch and fire that one in. Wonderful finish! Joe Hart is beaten at last and it's a cracking move from the hosts. Aleksandar Kolarov is caught out of position - he's not alone there - and when Julian Korb cuts the ball back to Lars Stindl he passes the ball in off the base of the post. "Wolfsburg have fallen asleep, they thought they had cleared it but United were alert to the second ball. A nice flick from Juan Mata and Chris Smalling was there to finish it off." And Manchester United lead! Juan Mata turns provider this time, helping the ball back into the box for Chris Smalling to stab in. Huge celebrations at the Stretford End. Rooney seriously lacking in confidence. Martial having a great game. I can't see us not getting three points here. Maybe get back to us at full time of that one Russell. First City attack well, Aleksandar Kolarov's cross is not good. Then Monchengladbach win a corner, it's headed down and fired in on goal but well blocked by Fernandinho. Saved a certain Joe Hart save. City then break four-on-three but David Silva can't find a man. Great 0-0! Tom Robertson: Raheem Sterling out of his depth at this level. His only attribute is his pace and running at defenders which he isn't doing. The Oracle: Sterling is an impostor and he continues to show himself up every time he wears the shirt. Wish we had bought Downing. Richard Holliday: Why is there any debate over Joe Hart? What more does he have to do to be ranked up there? He's a big head but a game saver. City: porous at the back, potent up front. They script a lovely passing move which pulls the German side from side to side and frees Aleksandar Kolarov, he drills it in low and it's well defended at the front post. Goals in this. Indeed they have, and only a great recovery clearance from Matteo Darmian prevents Bas Dost from getting a tap-in. "Wolfsburg have clearly been told to have a go at Manchester United early on in this second half. They have really come out the traps." Joe Hart again! He is denying Raffael time and again, more poor defending allows the Brazilian a run in on goal but Hart dives away to save brightly. Without Vincent Kompany this City side is a shambles. Kyle Utterson: How bad does Manchester United's opening day loss look now with CSKA 3-0 up on PSV - plus they have also missed a pen too. Ryan Paul: It has to be said, Man Utd's only weakness this season has been finishing more of their chances. They look really dominant. Joel Hudson: What's wrong with United's finishing? Rooney and Memphis should have put those chances away! Yaya Toure is off at the break, he is replaced by Fernando. Under way. Ashley Young is on at left-back, Antonio Valencia off. Martial - buy of the summer? We asked, you voted. With 51% of the votes, it's Anthony Martial who was chosen as the Manchester signing of the summer. Kevin de Bruyne way back in second on 24%. Thanks! There is only one game without a goal at half-time, that's at Borussia Park. Elsewhere in Manchester City's group it's Juventus 1-0 Sevilla. Juve, struggling in Serie A, won at City last time out. CSKA are 3-0 up against PSV, who beat Manchester United. And Chelsea old boy David Luiz got himself on the scoresheet for PSG who are beating Shakhtar 2-0. AJ Balmer: Joe Hart is an incredible keeper and has been for a few years, he's never been helped much by his defenders for England and City. Photogenic: Joe Hart could be a great goalkeeper like I could be a great husband, it's all about application. Juan Mata has been involved in 13 goals (8 scored, 5 assisted) in his last 21 games for Manchester United. Has he finally found his place in the team? Just having that discussion in the office Noel - where do we rank Joe Hart? Tom Miszkowski: Martial is absolute class already, just imagine what he's going to be like in a few years' time. Lifa Nati: Mata is a man reborn, you wonder where Chelsea would be with him in the squad. Another Mourinho mistake. "Probably a fair scoreline on reflection of the play. United have dominated the possession, they have ran at Wolfsburg at pace and they have quality in the final third. But they have not hit the target enough times. Wolfsburg, as we expected, look dangerous on the counter attack." Joe Hart has now saved his last two penalties in the Champions League, denying Raffael tonight and Lionel Messi last season. Everton manager Roberto Martinez is here. His team take on United in the Premier League on October 17. By now he has probably worked out it won't be easy to keep Anthony Martial quiet. Not many 19-year-olds have quality like him. City are nearly as dangerous in attack as they are at the back. Good move again, Kevin de Bruyne involved as Raheem Sterling heads on target. Weak though. Ejomedia Owebor: Joe Hart is having a blinder for Manchester City. Christian Reilly: My verdict on Otamendi this season so far? Great hair. Awesome beard. That's all. Muhammad Arslan: City lucky not to be 1-0 down after that penalty miss what's happening with all the English teams in the Champions League? Cristiano Ronaldo creeping closer to that record we talked about earlier - Real's goalscoring record. Only two more to go. He has just put Real Madrid 1-0 up against Malmo, it's his 500th career goal in 753 games. Pretty useful. Tom Miszkowski: All the talk about making the top 4 is futile if the English teams are going to play like this when they get there. Ray Muamba: Never as a United fan have I wanted City not to concede. English Champions League places are at stake here! C Li: The results in the latest Champions League round shows the current lack of quality in the Premier League. What a chance for Manchester United to take the lead. Juan Mata drives forward, switches to the ball to the unmarked Memphis Depay on the left, but his left-footed shot is blocked by the legs of goalkeeper Diego Bengalio. Well, this is extraordinary. Manchester City in all sorts of grief in defence once more and Fernandinho goes in on Lars Stindl. That's more of a penalty than the one which was given earlier - but Stindl is booked for diving instead! Vincent Kompany does some job holding this lot together. Terrible defending from [INSERT ENGLISH SIDE HERE]. Manchester City are carved open once again, Patrick Herrmann is clean through and Joe Hart is exposed once more. Great save! Hart having a brilliant game. If it wasn't for Joe Hart, Manchester City would be trailing. Another brilliant save from the England man, who rushes out to deny Raffael - who was clean through after centre-back Nicolas Otamendi switched off - with an outstretched left arm. Schmeichelesque. "He lifts his hand up in the air and you have to give the penalty. And it's a calm spot-kick from Juan Mata, he's played well so far for United and confidently sends the goalkeeper the wrong way." Wayne Rooney does not take the penalty, Juan Mata steps up and places it easily into the bottom corner. A deserved equaliser. Juan Mata crosses - hits the arm of goalscorer Daniel Caligiuri - penalty! "Old Trafford is very quiet. Expectations are very high here, but Wolfsburg are dictating the pace of the game and controlling it well." Wolfsburg are so comfortable on the ball, take a bow Caligiuri. They really are good on the counter attack. Get in touch at #bbcfootball, pop on to the BBC Sport Facebook page or text us on 81111 in the UK only - don't forget to say who you are and where you are texting from. Interesting to see how the approach of both managers differs. Even with the scoreline going against his team, Louis van Gaal is nowhere to be seen. In fact, the only thing in the United technical area at present are half a dozen water bottles. By contrast, Wolfsburg manager Dieter Hecking is a constant presence right on the edge of proceedings, looking quite stylish in his white shirt and black jumper. City may consider them fortunate not to be behind after Raffael's penalty miss. But, as the heatmap below shows, the visitors (on the right) are the team hogging possession in the other half. City are still probing down both flanks, whipping in nine crosses in the opening half an hour. Shohidur Rahman: And still people will defend Rooney. Shocking miss. Koketso Khala: That shot from Rooney doesn't do any justice at all to the work done by Martial on the right. Benhard Naweseb: Wolfsburg looking dangerous every time they go forward. Sergio Aguero shoots wide with his left foot before City spring Raheem Sterling away. Great game this, both sides attacking, but Sterling's cross in is poor and it doesn't reach Aguero in space. There's a goal coming for the men in red. Has to be. Juan Mata picks out Memphi Depay with a cute pass over the top and he leans in and heads straight at Diego Benaglio. "Wayne Rooney couldn't sort his feet out quick enough for that chance. He was leaning back and just can't hit the target with the side of his boot. He should be scoring from that position really." Oh what a chance! You have to score that. Especially when you're England's record goalscorer. Bastian Schweinsteiger threads a beautiful pass to Juan Mata, he frees Antony Martial on the right, Martial skins his man - standard - and then pulls it back from the dead-ball line. It cuts out three bodies and falls at the feet of Wayne Rooney. Open goal, nine yards out, just tap it in. He fires over. Miles over. He's good this kid... Anthony Martial again beats his man with ease before laying it off to Bastian Schweinsteiger. The German moves the ball on to his left foot, leans back - and hammers it over. Gavriel Seitler: Manchester City have started well. But why give a penalty for that? Laurie Bell: If City are anything to go by, Argentines can't defend either. John Dunthorne: Premier League teams can not defend, maybe because we want helter-skelter football in every game. Do not see that changing though. Wolfsburg have steadied the ship after that little flurry from Manchester United. Can they see this out until half time? "A great bit of gamesmanship by Joe Hart, who went round the back of the goal to get a drink before the penalty was taken to make Raffael wait as long as possible to take that kick." A brilliant few minutes here. Joe Hart at the heart of it again, catching a cross and then playing an amazing 55-yard pass on the half volley, right into the run of Sergio Aguero. Aguero is clear of the last man, the angle is wide, but he drags a shot just wide. Old Trafford is not the only ground where there has been a goal. In Lviv, Serge Aurier has put French champions PSG 1-0 up against Shakhtar Donetsk - and he's done it just seven minutes into his Champions League career. CSKA are one nil up against Dutch side PSV in Moscow. And the early game finished Astana 2-2 Galatasaray. Looked a bit chilly in that one. The average positions of both sides show Manchester United are more of an attacking threat, despite being behind. Mind games from Joe Hart! Hart keeps Raffael waiting for an age, he goes behind the goal and has a drink of water. Really pushing his luck. He makes Raffael wait and wait, and then steps up and makes a flying save! Nicolas Otamendi trips Raffael and it's given as a penalty! Was there much contact? It was clumsy. Poor defending. "You can see why the Manchester United fans have taken to Anthony Martial quickly. He's very direct and fearless running at defenders. He showed good strength as well." Manchester United have found life. They get the ball back into the fee of Anthony Martial and he excites once more, skipping past one man and beating a second before flashing a left-footed shot over the bar. Francis Edwards: Even at Old Trafford, I can't hear the home crowd at all! Why are English fans so silent compared to European away support. Andrew Clark: Anyone who underestimated Wolfsburg hasn't seen enough of the Bundesliga. Hosh Hammond: Manchester United are SO slow starting. only be a matter of time before a team hits them early and gives them twice as much work to do. This game has plenty of goals in it. Mark my words. City, without skipper Vincent Kompany, look vulnerable at the back but they are exploiting the German side down the flanks. This is perfectly illustrated by the build up to Sergio Aguero's golden chance earlier - City started down the right before switching play to the other flank where Raheem Sterling made progress to cross for his Argentine team-mate. Best moment of the night from Manchester United. A good cross from the left from Matteo Darmian works its way through to Juan Mata on the right, he take a touch and curls a shot on goal. It's going in too, until ex-Bayern centre-half Dante gets his head on it and clears his lines. That's lifted the crowd! Footballing artists? Zidane all day. "The dozen or so Wolfsburg officials present were taking selfies ahead of kick off to mark their visit. "Within five minutes of kick off they were on their feet again to celebrate Daniel Caliguri's goal. "Not even an attempt to suppress their glee." Manchester United have not looked like getting back into the game yet. Pedestrian stuff. "There's been a lot of loose passing from Manchester United so far, and not a lot of forward movement either. If I was a United fan in the stands I'd be concerned how this game has started for my side as Wolfsburg have seen more of the ball." A few sides conceded from their own corners last night, and Manchester City go close to joining the list! Their corner is headed out, Kevin de Bruyne tries a volley, misses his connection and Gladbach can spring away. They have a three-on-two break - with David Silva one of the two haring back - and Patrick Herrman drags his shot wide in the end. Far too open! Ben Peterson: Just utterly dreadful defending. Valencia has no excuse for playing everyone onside. Paul Humphreys: Great start lads. Valencia proving his worth at right-back there. Stuart Mitchell: Here we go again, same rubbish different day. Man utd 1-0 down. That was more than pathetic from Blind, Darmian and Valencia! Opera singers, an artisan DIY showroom and a pop-up research library are all part of this year's Turner Prize exhibition, which showcases the latest nominees for the prestigious art award. Nominations please for footballing art entries. Goals, players, quotes - the beautiful game as an art form. A quick update on that Sergio Aguero chance just before the Wolfsburg goal. Fine work down the left by Raheem Sterling, he put over a low cross which was well-weighted, Aguero read it well but his shot from six yards was well saved. Kevin de Bruyne now gets away on the right and puts over another fine low cross which is not converted. City looking sharp. "I have got to say I was impressed with Daniel Caligiuri against Bayern Munich and he's produced here. It's a cool finish, but what was Antonio Valencia doing? He played everyone onside. That's great counter-attacking football from Wolfsburg though." Manchester United were absolutely cut apart by a six-pass move. The goal graphic below doesn't show the horrific positioning by Antonio Valencia. Wolfsburg take an early lead as the Manchester United defence goes into self-destruct mode. A silple passing move is eventualy worked through, three-quarters of the back four step out, Antonio Valencia does not and Daniel Caligiuri is onside with the freedom of the box. He waits, and then slips the ball past David de Gea! What a start for Wolfsburg! Hugh Rodger: Let's not forget David Moyes didn't lose a single group stage game as Utd boss and qualified top of group. Photogenic: English teams don't appear good enough in Champions League 'cos they aren't good enough, no mystery. Good players don't make good teams. Tim Watson: Even with the threat of losing the fourth champions league spot, cannot bring myself to support Man Utd. What a save! Sergio Aguero should score from Raheem Sterling's cross but it's a magnificent save from Yann Sommer! City need to start well but instead they start very sloppily as Yaya Toure is slow to read the danger in front of his defence, the Foals gobbles up the loose ball and find Raffael breaking into the box. A clean strike would give Joe Hart an early work-out but he slices the strike well wide. Terrific noise inside the staduim! Gladbach lining up with two up front, a rare 4-4-2 outing in the Champions League. City persevered with that shape longer than most. David Silva starts in the 10 role behind Sergio Aguero. And we are under way in both games. England v Germany. European football expert Andy Brassell, speaking to 5 live: "One player to look out for tonight is Borussia Monchengladbach's stand-in captain tonight Granit Xhaka. The young Swiss midfielder is a real talent." Surely some sort of Lifetime Achievement Award for King Eric. If it wasn't 'that goal' v Sunderland in 96, it was the revolutionary upturned collar or the birth of the seagulls and trawler man quote. The original hipster of the 90s. A Hipster Salmaan? Well he is sporting a beard nowadays so I suppose you are right. Muhammad Owais: I can see only two English players in United's line-up. What is all that fuss about United promoting english players? Can't see them here. Diego Smith: No pride in the imports, that burning hunger not to let the isles down and typical British pride gone in our top four in the Champions League. Paul Table: The Champions League is a tired comp. Same teams each year. You should only be able to qualify every other year. Spread the wealth. This is a bit like saying there are plenty of attractive people in Stockholm, but the atmosphere in Gladbach looks and sounds absolutely terrific! Gladbach's first home game in the European Cup since 1978. Bouncing. Flag-waving, scarf-twirling stuff. Get me a ticket. Manchester United manager Louis van Gaal on BT Sport: "After the defeat in Eindhoven we have to win all our home matches, then we have nine points and you are nearly in the next round. "Matteo Darmian is a defender, he has played as a left-back in Italy and Antonio Valencia has played very well as the right midfielder." "I think Manchester United's attack has pace and looks dangerous at the moment. "Whether it's wide with Memphis Depay or up front with Anthony Martial, who has hit the ground running, while Wayne Rooney is in this best position just off them. "That front four, with Juan Mata as well, can score goals. Teams are getting more wary of United again. They are sitting back and not asking as many questions." There may be trouble ahead...? Where did I park again?Image caption: Where did I park again? Wolfsburg boss Dieter Hecking may find his January transfer window wishlist buried under a mountain of files in the club's in-tray. In case you weren't aware, the club was founded in 1938 as Stadt des KdF-Wagen to house autoworkers building the car that would later become famous as the Volkswagen Beetle. The club are still owned by the car giant - who are engulfed in a crisis at the moment over diesel emissions. Why does that matter? Well they are facing a fine of $18bn (EIGHTEEN BILLION DOLLARS). Pick the MOTD goal of the month music! It may not have the same status as a Brit award or an Ivor Novello but some of the biggest and best in the business have been lucky enough to grace Match of the Day goal of the month. Now, we’ve decided to team up with our friends at Radio 1 to give you the chance to choose the soundtrack to September. Which of the following do you want to hear on TV this Sunday night? Go to this page and vote for your favourite choice. We’ve also tweeted a link to the voting page via @bbcr1 on twitter. Voting will be open for 24 hours – and will close at 18:00 BST on Thursday 1 October.